Over a period of two years, one young officer brightened up the lives of British and allied military fighting The War To End All Wars (which will be over by Christmas) by producing a satirical trench newspaper known as The Wipers Times. This is true, and the story that unfolded this evening was based on the writings, findings and documented lives of this man and those with whom he served, namely one Captain Roberts. Incredibly, the vast majority of the jokes in the play are taken from the newspaper, showing not only that the humour is as fresh and current today as it was a hundred years ago, but also dispelling the myth that life in the trenches didn't mean one lost one's ability to laugh and have a sense of humour. "A: The war is not funny. B: The authors are aware of that." The play itself lies somewhere between the bouncy End Of Pier show satire that is 'Oh What A Lovely War' and the very down to earth realism created in R. C Sherriff's 'Journey's End' (and if tonight's narrative is to believed then the very same R.C. Sherriff also contributed to The Wipers Times). However, what I think surprised me the most this evening was something which affected me on a personal level. Both my grandfathers fought in WW1; both were for some time stationed in Ypres, and I have heard mention of The Menin Road, Hellfire Corner, Vimy Ridge, Passchendaele etc from their handed down anecdotes; and I also know that both of them were also sent to fight on the Somme, and both went over the top several times with fixed bayonets, and amazingly both lived to tell the tale. And so to find that the journey of this evening's hero was similar was surprising and interesting. "A: Someone has to account for the war. B: We should leave that to history." 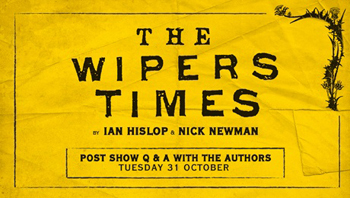 This play, itself adapted from the film of the same name, was written by Nick Newman and Ian Hislop, and funnily, this didn't surprise me. I could hear Hislop saying many of the lines in the play himself, almost as if he is the reincarnation of Captain Roberts for the modern era! This show had Ian Hislop written all over it - but in a good way (for those of you who don't know then Ian Hislop is the editor of Private Eye). With camaraderie, bonhomie, truth, Musical Hall style songs, and a huge dollop of satire, this play shows us life as it really was in trenches written by those who were experiencing that life first hand; and how against all the odds - disapproval from Top Brass, enemy fire, and lack of any real sanitary living conditions, not to mention the fact that life-expectancy in the trenches was 6 weeks - the newspaper and Roberts both survived the war. My personal feeling is that the play is a little long. Everything that needed to be said could have been done so a little more concisely shaving off about 20 minutes to the running time, and I didn't like all the 'false endings' to the play either. The play first came to a natural conclusion after the clever parody of Kipling's 'If'', but then went on for a further ten minutes and then, even after the curtain calls, we had another rehearsed and choreographed routine for no apparent reason. Set in a bombed out building in Ypres, pronounced as Wipers by the British, the design is a composite multi-functional one which actually works surprisingly well (Dora Schweitzer), and with effective lighting and sfx, the stage transforms quickly and simply from Officers' Mess to Somme trench. Costumes were accurate and authentic, and the whole had a feeling of dignity and worthiness about it. The cast, in the main, were excellent, doing a sterling job of keeping the narrative alive and telling the story. James Dutton as Captain Roberts was utterly believable and a very watchable actor too. Playing an array of senior officers, comrades and folk back home were 9 other actors. I especially liked Dan Mersh's seamless metamorphoses from Deputy Editor to General Mitford - two lovely and completely different characters, and George Kemp's Lieutenant Pearson. Sadly Emilia Williams' portrayal of Kate was rather quiet and insipid. All in all the play tells the story with a certain charm and it is credit to director Caroline Leslie and her imagination in re-creating these real people and making the play still resound and have relevance today.